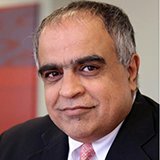 Sanjiv Kapur serves as Senior Advisor at EMPEA. Sanjiv brings to the organization over 25 years of emerging markets private equity investment experience and contributes to EMPEA’s global mission through his deep industry relationships and diverse market expertise. Previously, he was a founding Managing Director at Wolfensohn Fund Management (WFM), which manages a US$250 million global emerging markets private equity fund. He served on WFM’s Valuation and Investment Committees and the Boards of Ujjivan Microfinance and Fabindia. Prior to joining WFM in 2006, Sanjiv was Senior Partner and Head, Asia Pacific Private Equity for Henderson Private Capital in Singapore. In this capacity, Sanjiv managed a successful $210 million Asian private equity fund that invested in China, India, Korea, Singapore and Thailand, and served on the Boards of HT Media and Maginet. Sanjiv also headed AMP Capital’s private capital investments in Sydney, Australia from 1999 to 2002. Furthermore, he invested across Africa, Asia, Central Europe/CIS, and Latin America in funds and financial institutions while working from 1989-99 at the International Finance Corporation (IFC) in Washington DC serving in many roles including as Head, Private Equity and Head, International Securities Group. He has served on the investment committees of several private equity funds, including Capital Z Asia II, AXA-AIG Select Global Fund of Funds I and Asia Equity Infrastructure Fund. He also headed the $235 million Henderson Global Fund of Funds investing in the U.S., Europe and Asia. He served on the Boards of Handlowy Heller (Poland) and CIC (Chile). Sanjiv also worked in New York at HSBC Group (Vice President, Sovereign Risk Management), AIG and State Bank of India. Sanjiv has a B.A. in Economics (Honours) from St. Stephen’s College (Delhi University) and an M.B.A. with Distinction from the Thunderbird School of Global Management. He was elected to the Executive Committee of the Singapore Private Equity and Venture Capital Association (2003-05). Sanjiv also serves on the Board of Fellows of the Thunderbird Private Equity Center in Arizona.